IAM International President Bob Martinez announced today that District 15 Director of Organizing/Business Representative Vinny Addeo will assume the role of Director of Organizing for the IAM, effective January 1, 2018 upon the retirement of current Organizing Director Don Barker. Addeo initiated into Local 702, in 1980 when he began his career as an Aircraft Technician for Eastern Air Lines at Miami International Airport. He transferred to US Airways at Newark International Airport, Local 1445, where he served in many capacities. In 1998, Vinny was appointed as a District Organizer for the IAM’s Transportation Department where he served for seven years organizing in the airline industry. 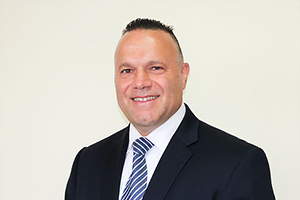 In 2005, Addeo transferred to District 15 in Brooklyn, New York, as the Director of Organizing/Business Representative for District 15, Local Lodge 447 where he currently serves. Addeo holds a Master of Science degree in Labor Studies — Union Leadership and Administration from the University of Massachusetts, Amherst, Massachusetts, and a Bachelor of Arts degree in Labor Studies from the National Labor College, Silver Spring, Maryland. Addeo is also a certiﬁed instructor for the National Safety Council.